First, let me just say that I almost met my match in terms of spatial problem solving today. Almost, but not quite. I arrived at the elementary school this morning where I'll be working in the LGI room for the next two weeks with some awesome 4th graders and their teachers. The LGI room is an extremely irregular septagonal shape, with a long diagonal and without any linear referents on the floor (no patterned carpet or tiles). 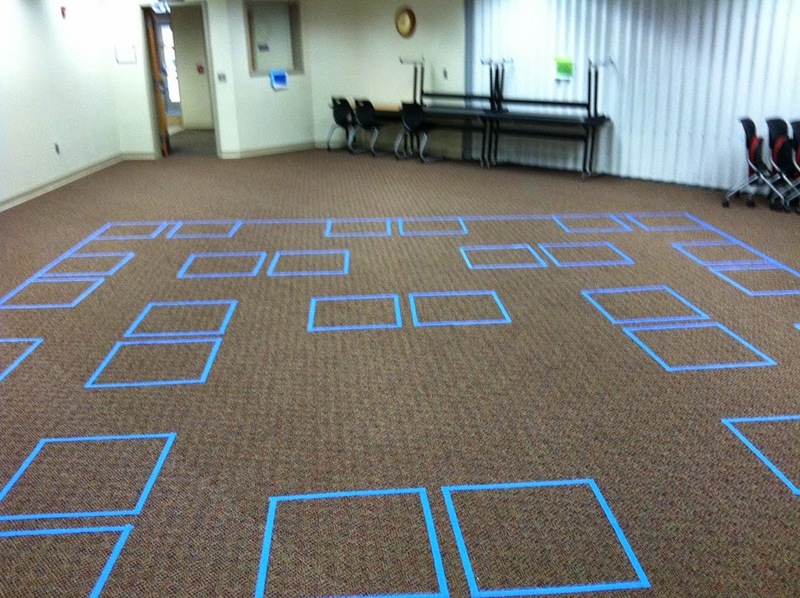 Add to that our taped dance spaces are square. It was my job to square the space. Given the difficulty of the task, I think I did a pretty good job. What do you think? 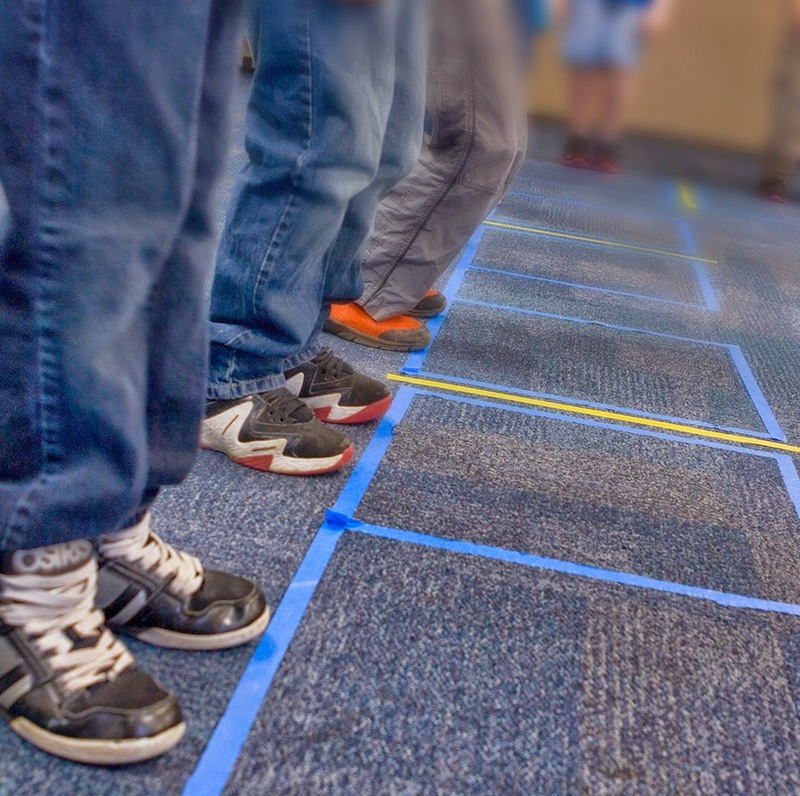 Note #2: Why do we use so much tape in Math in Your Feet? 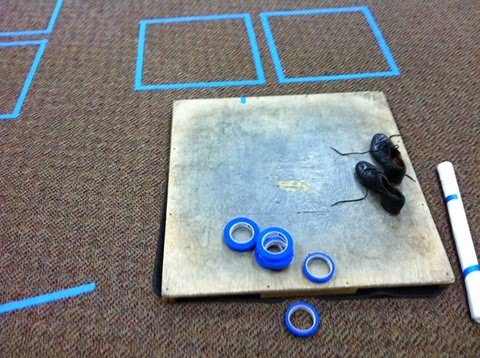 Because we do better, more interesting work inside our own dance spaces. Because it helps us focus on the relevant structure and shape of our dancing. Because dancing in limited space is part of many traditional percussive dance styles. That's why! Note #3: What do I look for on the first day with a new group of students? Can they keep a steady beat? Do they know their lefts from their rights? After a few rounds of our 4-count patterns during warm-ups do they get that we are dancing for four beats, and resting for four beats (signified by claps)? Do they get the essential structure of the pattern unit and stop their movement on beat 4 or do they keep dancing? Are their bodies organized? What challenges do they have lifting their feet off the ground? Do they loose track of their personal space and bump into their neighbors or end up far away from the rest of the group? Is it just a few kids, or the whole class? When I give them words to say while they are dancing (e.g. "Split, cross, split, together") can they talk and dance at the same time? Or does the talking throw them off?